Aye BMW! Aye wow BMW! Yep, that’s what I was hearing the whole time. Honestly, it felt good sometimes but sometimes embarrassing. First things first, the bike will attract many eyes. Many! 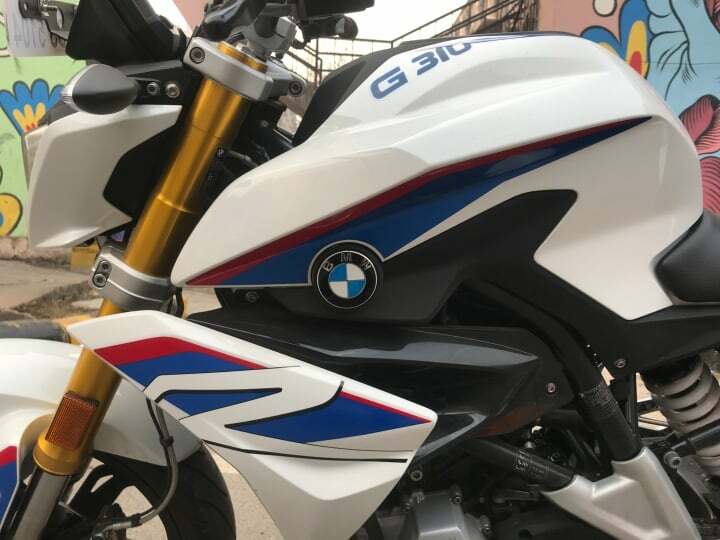 BMW Motorrad said that G 310 R is better for your daily usage too. So, here we have the baby BMW to put it through daily usage. 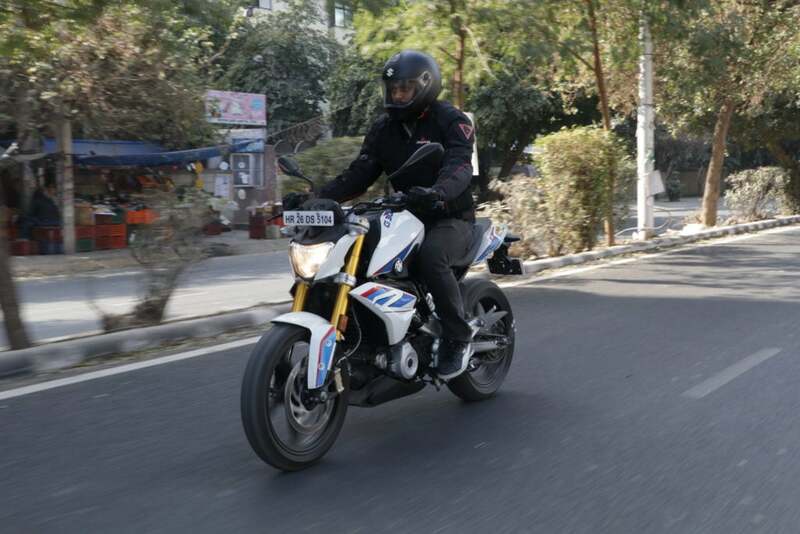 We got to test its mileage, ride handling, top speed and comfort for 6 days. 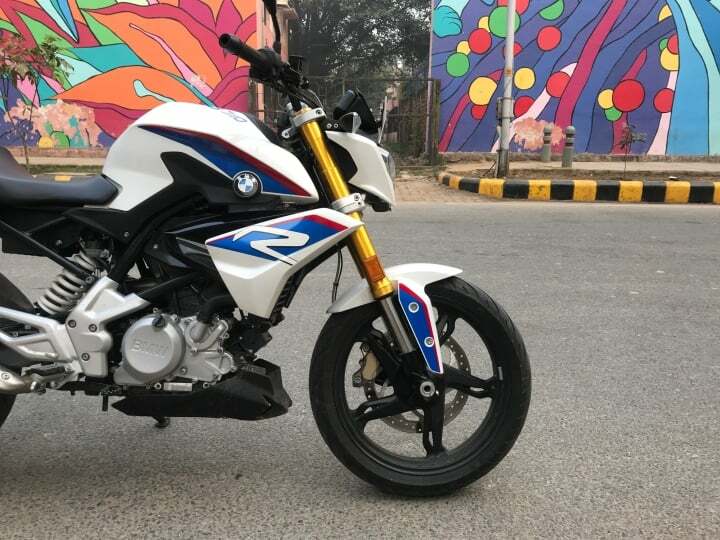 BMW has taken a leap in the sub-500cc motorcycle segment with its BMW G 310 R naked roadster. The bike has been built in partnership with TVS at their Hosur plant. The engine has been borrowed from TVS Apache RR310 and so are some cycle parts as well. At a price of Rs 2.99 Lakhs (ex-showroom), G 310 R is one of the priciest 300cc motorcycles among its peers. 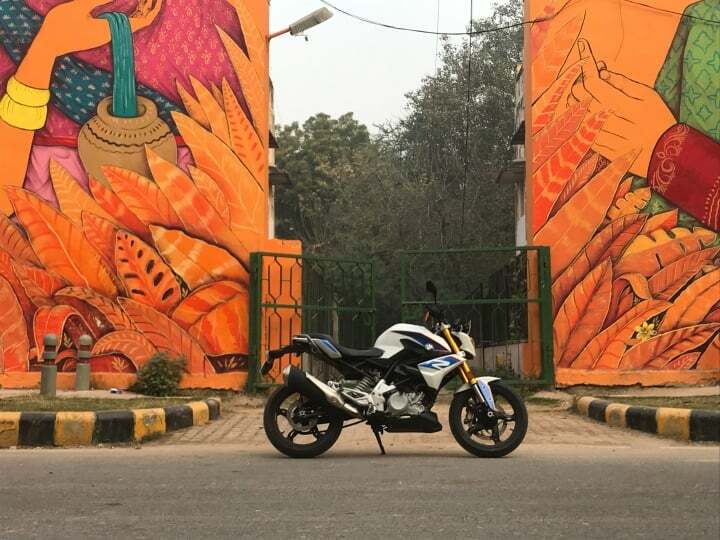 It competes with the likes of KTM Duke 390, Kawasaki Ninja 300, TVS Apache RR310, Benelli TNT300, TVS Apache RR310 and Royal Enfield 650 Twins. What do I talk about its styling? One look and you know you got yourself an upscale bike. If you miss the BMW badging, probably people would still turn their heads to it. 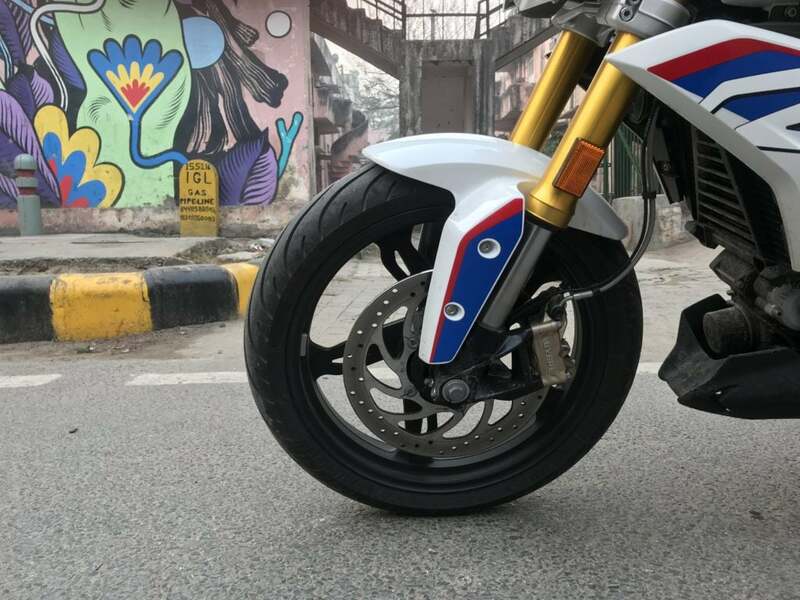 The bodywork of BMW G 310 R shows that the bike is loaded with muscles and sharp creases. The fuel tank is set high to get the rider in a bit of dedicated riding position, not fully though. The fuel tank plastic shrouds with the ‘R’ badging is quite beautiful to look at. I got the HP Racing White colour, which as per me, is the best-looking colour option. The highlight of the bike is its gold anodized forks, which you would not find in a lot of bikes, especially in this range. The chassis frame combined with exposed lower body is a great way to show its dominance. I should tell you, I have developed a crush for its raw aggressive body. The power delivery is straight up front and it literally shows no lag in the throttle. Once you cross the 3500 RPM mark, you would feel immense pleasure to rev up the bike, even if you are in heavy traffic. You might find that the bike stalls too much at the low revs. The 313cc engine has been tuned in that way. However, for the city’s slow moving traffic, it might trouble a bit. To avoid the bike from stalling, I had to sometimes pick it up from half clutch. It takes a while before you get the hang of it, but there are chances of the clutch being worn out before its actual life cycle. 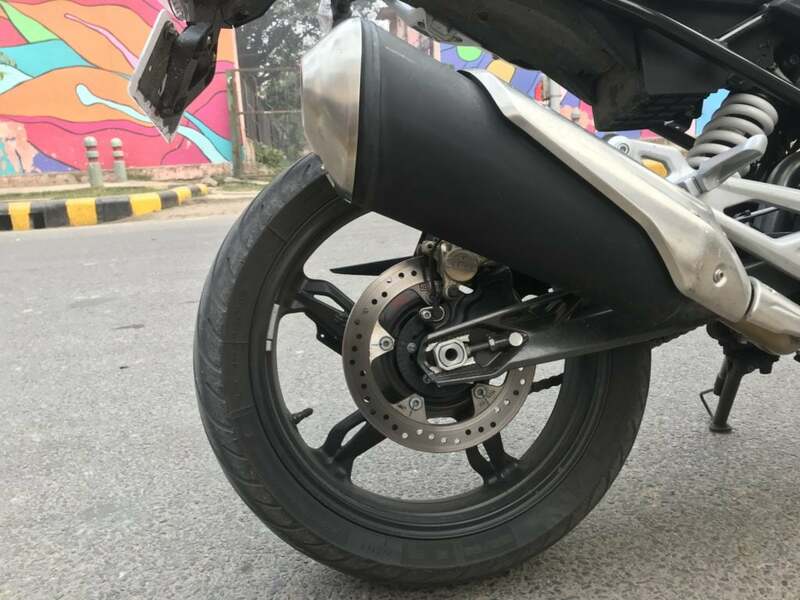 G 310 R’s sweet spot is between 3500 RPM to 7500 RPM. Once you cross that limit, there is no looking back. Between this range is the main juice which will help you in overtaking easily. However, after 7000-7500 RPM, vibrations start to build and they get heavier nearing the red line. It gets a performance aimed exhaust note, probably a softer version of Duke. The sportsbike-type note makes you rev up harder. I did it a lot of times, sometimes just to get my heart pumping and sometimes just to show off, cause its a BMW. I was able to achieve a top speed of 140 km/hr. 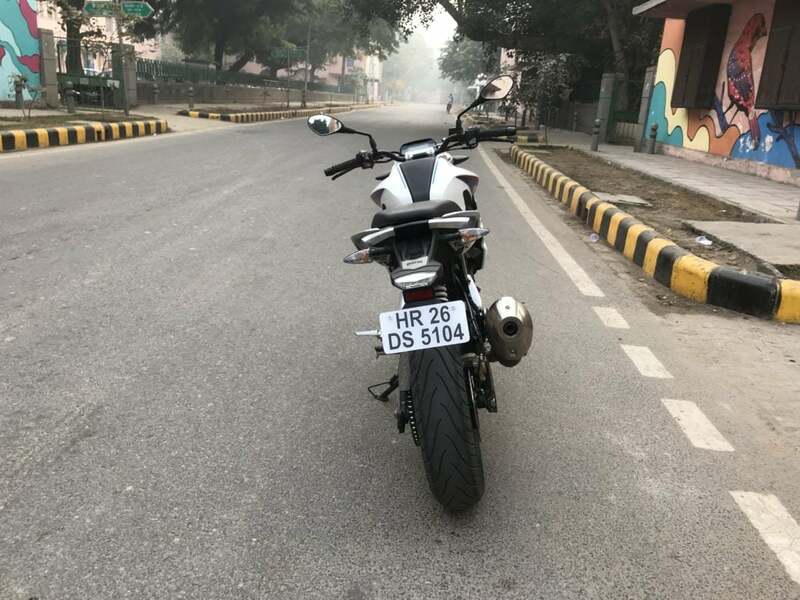 Trust me, I had to wake up really early on a weekend to find a free straight road in Delhi NCR. The bike is comfortable cruising at 100-110 km/hr for the whole day. Cross the cruising limit and the vibrations get really really strong and the bike gets desperate to calm down. 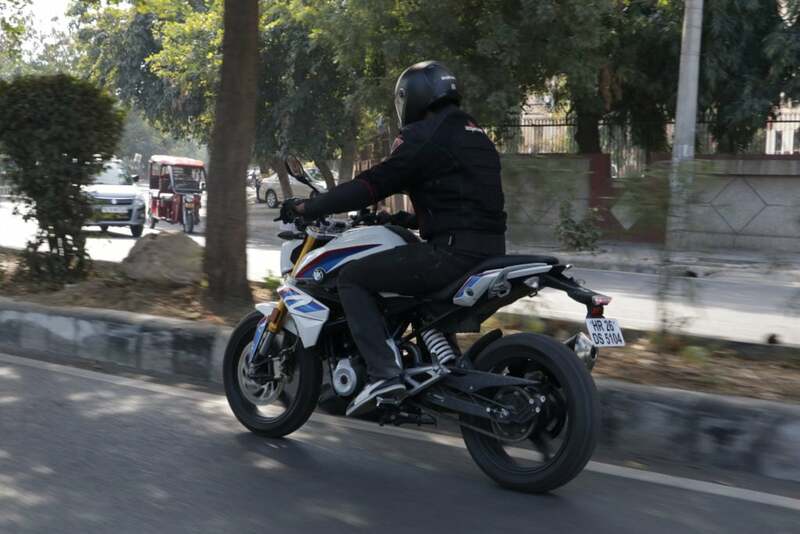 Summing up, leaving its weakness of picking up at low-end, it classifies as a city commuter as well as a long tourer. 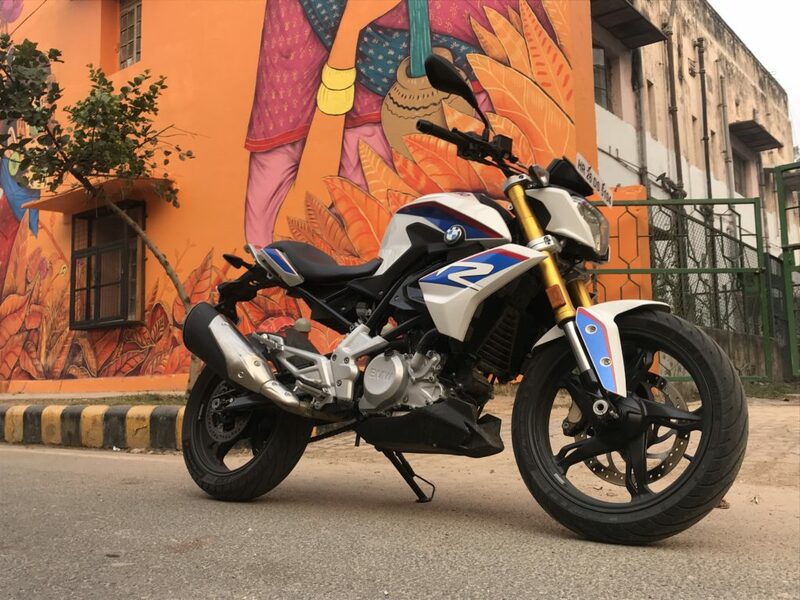 Long highways would be a perfect compadre from the G 310 R.
BMW G 310 R is so easy to manoeuvre, that you would actually enjoy taking it through corners. It becomes easy to zip-zap through the traffic. The upright stance makes it a lot easier to ride it around. It is nimble in handling and quick on its toes. The handlebar is set a bit lower than regular naked bikes and even the footpegs are set in a racing position. 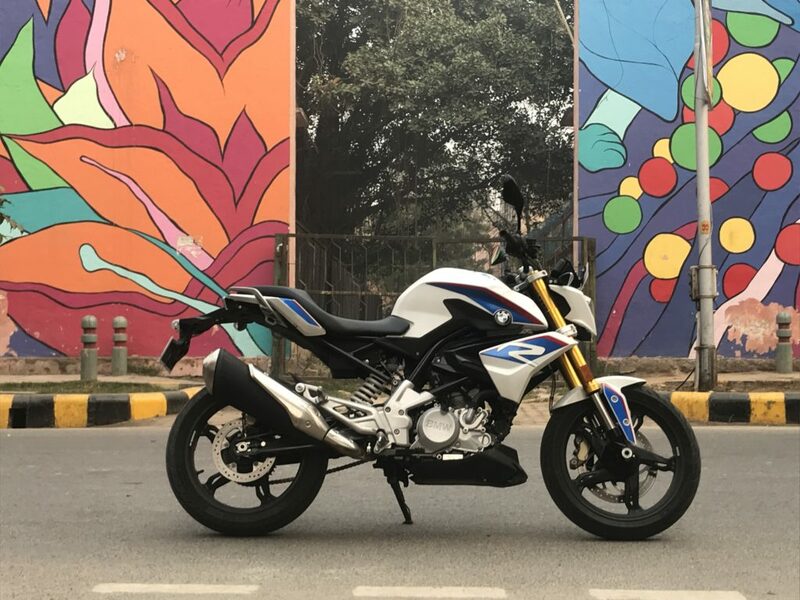 Cornering G 310 R was a piece of cake, thanks to the 17-inch Michelin Street Pilot radial tires. Light showers in the capital over the weekend got me a chance to check it on wet surfaces. The tires had a good grip, but since the tires were a bit worn out, they caved in for a bit or two. Don’t worry, with brand new tires, you won’t feel the same. Talking last about its handling on high speeds, well, it does wobble a bit. But the wobbling starts post 120 km/hr and in the city limits, you won’t cross that speed very often. 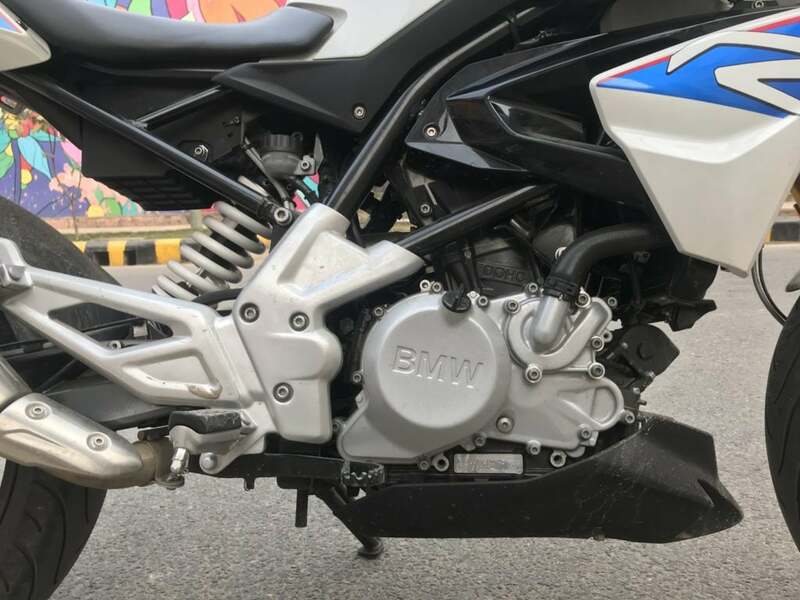 BMW G 310 R gets BMW Motorrad dual-channel ABS. The braking power was pretty strong and instantaneous. Even if you suddenly brake from 80 km/hr or even 100 km/hr, you won’t lose full confidence. It gets 300mm Bybre disc brakes at the front and 240mm Bybre discs at the back. ABS is necessary for bikes of such high capacity. At high speeds, if you have to brake suddenly, it gets really frightening. 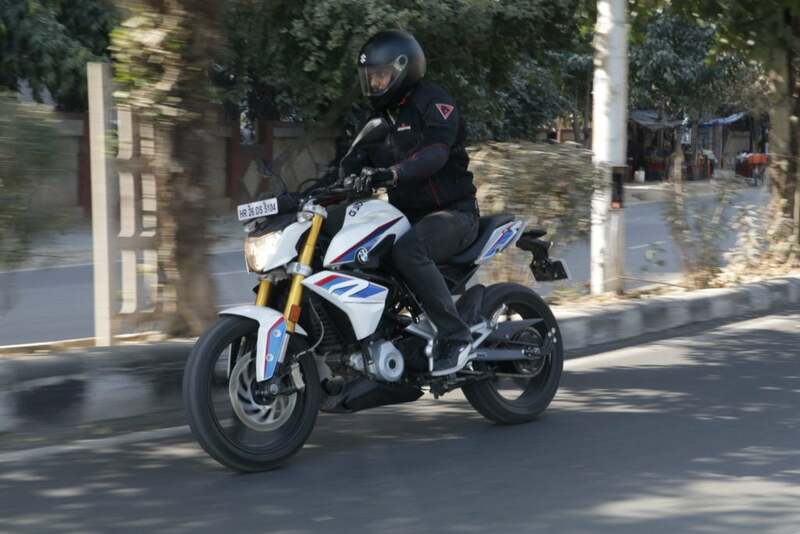 BMW G 310 R gets a very comfortable soft seat. My office commute is roughly 80 kms a day which involves around 20-30 kms in city traffic and the rest over highways. I was comfortably seated every single day of my commute. The pillion rider might have the opposite experience. The pillion will have to get into the riding position, to refrain from falling down. I was seated behind to test the pillion comfort and I was nearly going to fall. The grab rails are no help at all. And the pillion is also uncomfortable and a bit stiff. Coming on to the comfort over roads, it has been a delight. 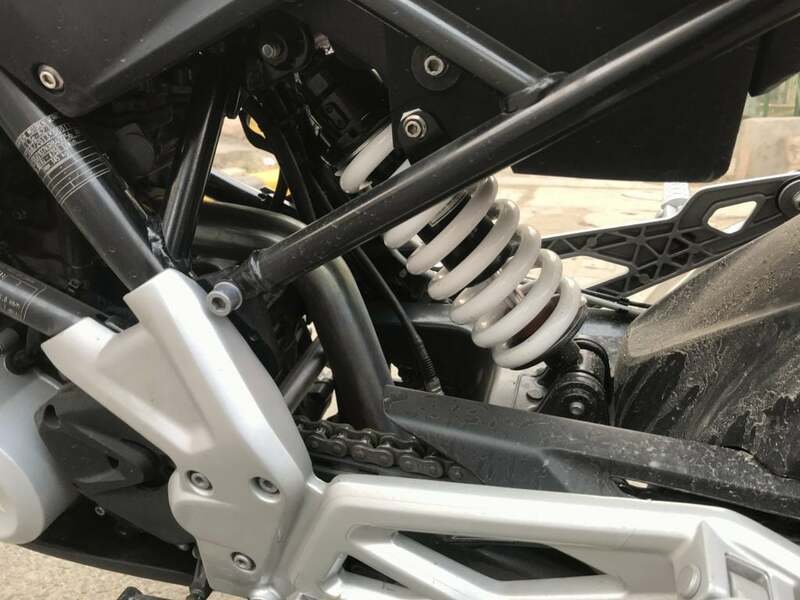 The 43mm Upside Down forks with adjustable rear mono shocks do the job perfectly. Even at higher speeds, jerks were minimal. It was literally gulping down potholes from the ridder and passing some effect of them to the pillion rider. 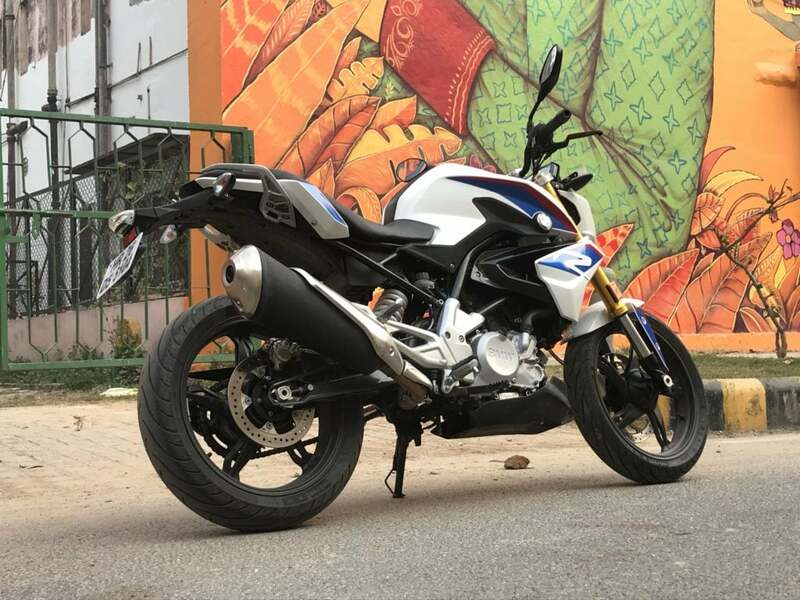 G 310 R returned a mileage figure of 30 kmpl in city. If you keep your revs high and follow an aggressive riding technique, the figures drop by 1 or 2 kmpl max. On the highways, we could achieve a mileage of 38 kmpl. Although, the average mileage on the instrument cluster showed 41 kmpl. With a usable fuel tank of 11 litres, we would get a total riding range of 320 kms. I would have done with a slightly bigger tank, probably even a litre or two more for better touring comfort. But that’s the work of its other half, BMW G 310 GS. 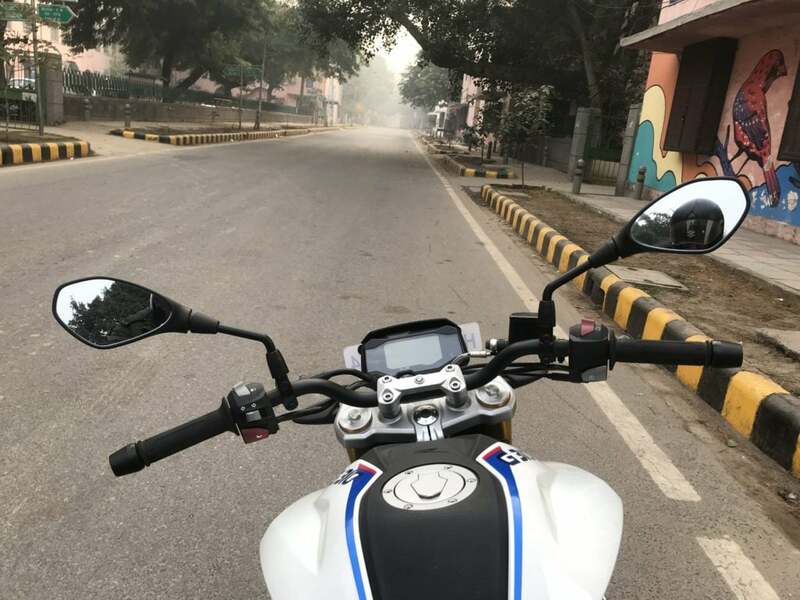 Features onboard BMW G 310 R include a fully digital instrument cluster, dual-channel ABS, LED tail light, Cast Aluminium Wheels and Smoked Turn signals. The digital instrument cluster shows information like average mileage, average speed, 2 trip meter, odometer, fuel gauge, gear position, distance to empty and engine temperature. 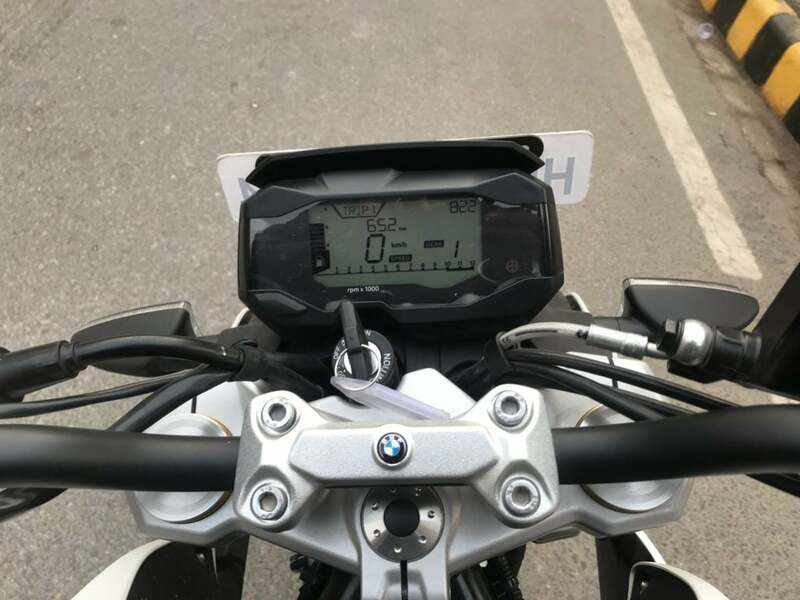 However, I feel since it a premium bike, BMW Motorrad could have given a TFT Colour instrument cluster with Bluetooth connection. Also, LED headlamps should have been given in the bike. Nevertheless, the cluster is informative and the headlamps are also quite powerful. With most of the emphasis made above, there is hardly anything left to say. You might have already figured it by now. 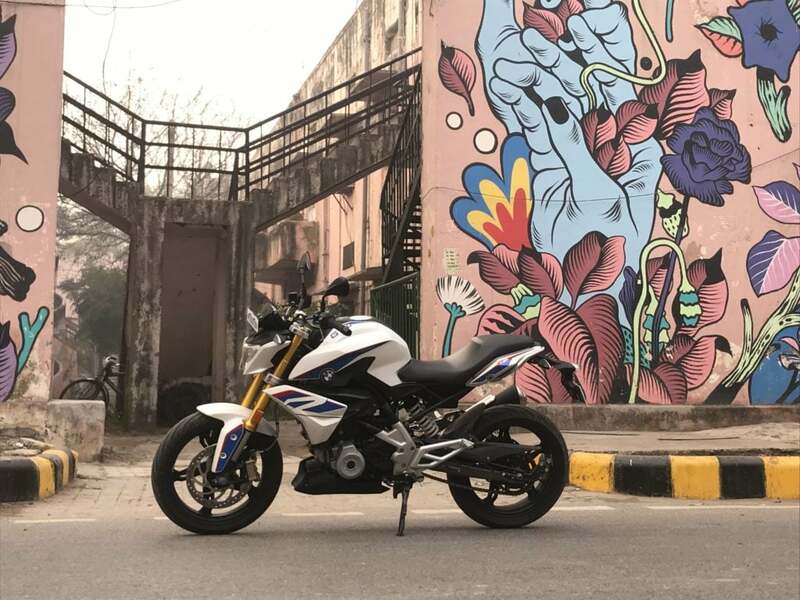 BMW G 310 R is the most affordable BMW bike in India. The pricing is a bit steep, to be frank, for people who are looking for a 300cc motorcycle ignoring the BMW fact. But those who like the fancy brand, this is what you are looking for. There are hardly any flaws in the bike, except its intolerant low-end torque generation. That might actually irritate a lot, especially in the city’s stop and go traffic. 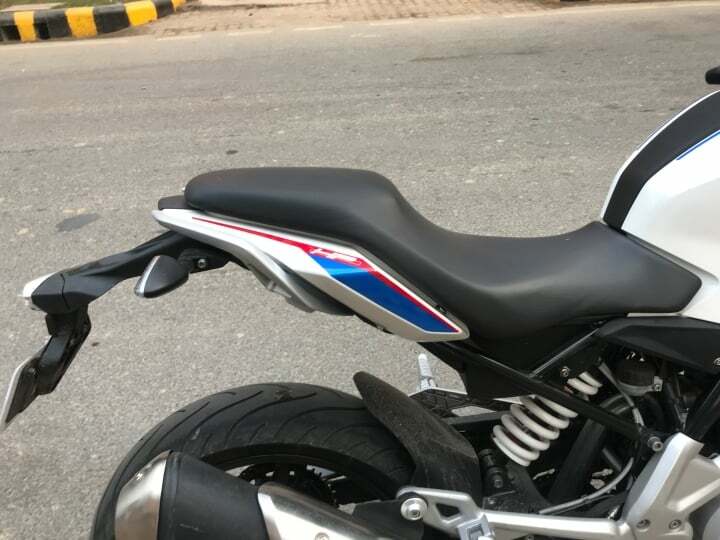 Agreed that it falls short of some equipment of a premium bike, but if you are looking for a strong, quick and nimble motorcycle under Rs 3 Lakhs, you can actually consider this.